What most strikes the first-time visitor to the Oxford Furnace is how tall the stone structure is--over two stories high--and how utterly intact it remains, despite time and weather taking its toll. Here there are no tumbled-down walls, no half-forgotten timbers slowly surrendering to the seductive decay of the forest floor. No, this relic of the eighteenth century stands for the most part intact, in no small way indebted to a recently-completed stabilization project undertaken by the Warren County Cultural & Heritage Commission. When it was built, the Furnace stood 31 feet high; sadly now it is only 22 because of the built-up grassy area surrounding the structure. 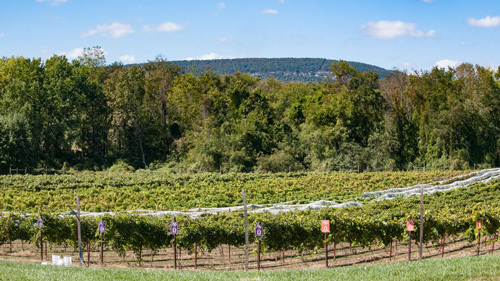 The project began in 1997 with a $315,000 grant from the New Jersey Historic Trust. Phase I, in the fall of 2000, involved Selective Demolition and Archeological Investigation, while the Phase II ­ Stabilization, was completed in the autumn of 2001. Some 70-75 tons of debris (firebrick, sand, stone, along with bottle caps, nails, ceramic shards, rusted nuts, bolts, and washers, a plastic comb, a toothbrush, and broken beer bottles) was removed from the bosh, the central cavity of the furnace, where charcoal, lime, and iron ore were placed during operation. 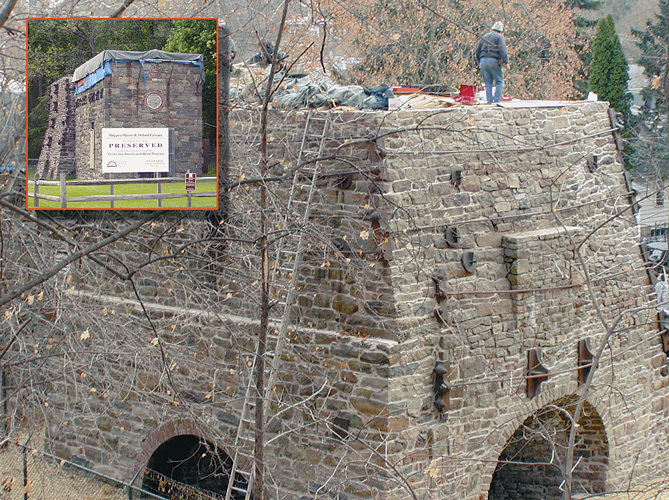 Other work included repointing the stone walls and installing a new wood roof. Restoration work in the furnace in the fall of 2001. The entire district surrounding the Furnace is listed on the State and National Registers of Historic Places. The distinctions that the Oxford Furnace holds are many. 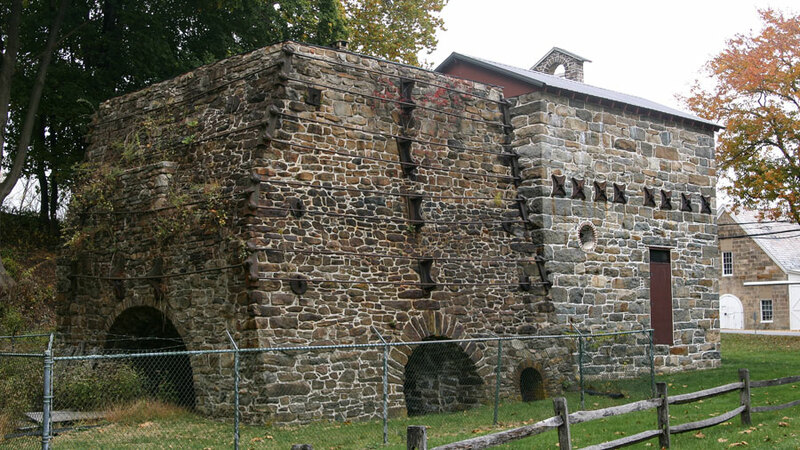 Built in 1741, it was the third furnace in Colonial New Jersey and the first where iron ore was mined. 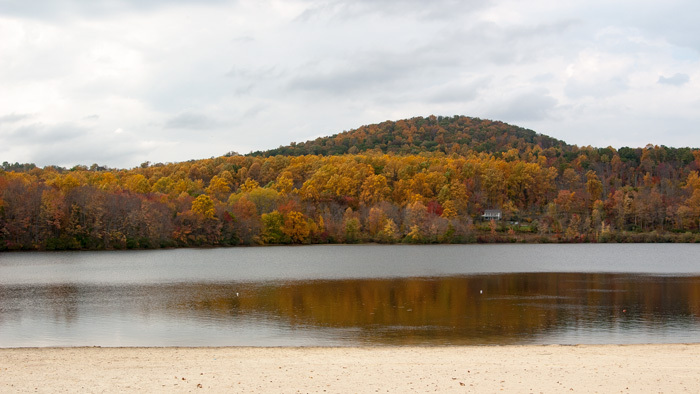 Prior to that time, ore was scooped out of bogs in South Jersey. And if all the above were not enough, the Oxford Furnace operated the longest of any of the Colonial Furnaces. The two furnaces that pre-dated it, Tinton Falls and Mount Holly, no longer stand, and furnaces at Ringwood, High Bridge, and Waterloo came later--with Oxford being "blown out" in 1884. It was also the site of America's first successful "hot blast" in 1835. Before that time unheated air was pumped, by bellows or other method, into the furnace. A hot blast sent pre-heated air into the furnace, and cut production time. Arches or "tuyeres" on three sides of the furnace can still be seen, and it was through these apertures that air was blown into the furnace; molten iron was removed through the fourth opening. The Furnace produced 200-500-pound firebacks and pig iron in its early days; later it cranked out railroad car wheels, nails, and other prosaic objects. In spite of popular legend, there is no proof that Oxford supplied cannon balls for any American war. 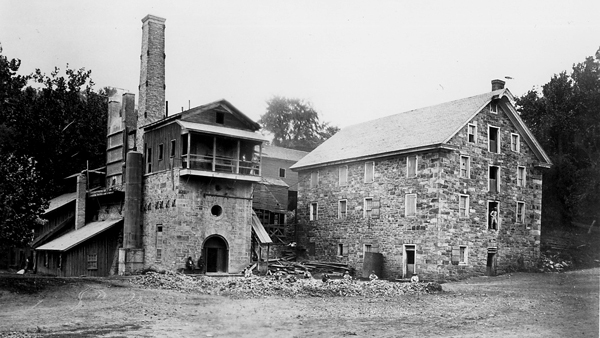 The Oxford Furnace in the 1870s. The grist mill next door is now the Methodist Church (below). Somewhere along the way, nine feet of fill was added around the furnace, so that today only part of the arches can be seen. When it was built, the Furnace stood 31 feet high; sadly now it is only 22 because of the built-up grassy area surrounding the structure. Immediately next to the Furnace stands the Engine House, dating from 1850. The Methodist Church that stands only yards away from the Furnace was originally the grist mill. Among structures still standing in the area are the Company Store and Car Wheel Factory, both circa 1850; rows of workers' homes; the mansions of the Scrantons; lime kilns; and a railroad tunnel, which starts in Oxford and heads under the hill toward Washington. 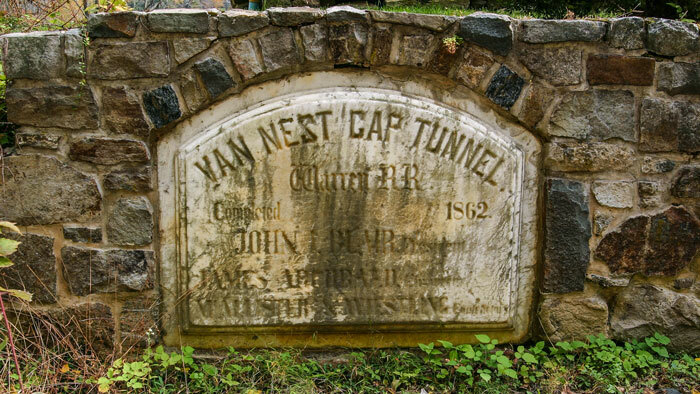 A plaque commemorating the completion of the Van Nest Gap Tunnel in 1862 rests in the wall alongside Shippen Manor. That path the visitor walks along was once the roadbed of the Warren Railroad. A plaque commemorating the completion of the Van Nest Gap Tunnel in 1862 rests in the wall alongside Shippen Manor. 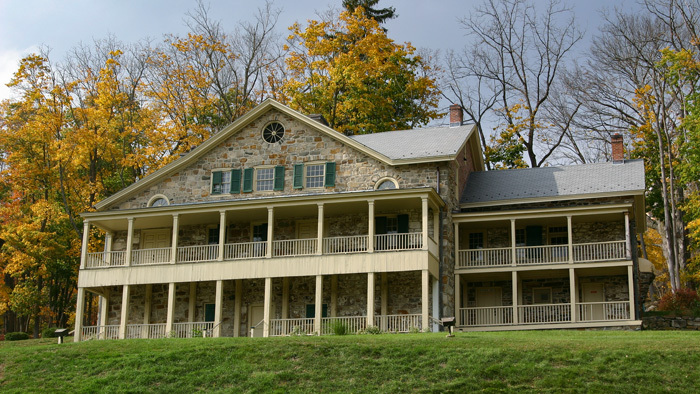 On a hill overlooking the Furnace and the village of Oxford Furnace (its historical name) sits Shippen Manor, once the home of the ironmaster and now a Museum. The Georgian-style stone mansion was built in 1753 by Joseph and William Shippen, owners of the Oxford Furnace, and at one time the estate consisted of 4,000 acres. Here, at the home of the ironmaster, the Shippens stayed when they visited their investment. The house also had a basement kitchen where the ironworkers ate. Jonathan Robeson, an experienced ironmaster, and Joseph Shippen, Jr., both of Philadelphia, built the Furnace. Later Shippen's brother, Dr. William Shippen, Sr., became a partner, then eventually the sole owner. Dr. Shippen was a member of the Continental Congress and counted among his worthy patients Benjamin Franklin, John Hancock, George Washington, and Generals Gage, Howe, and Lafayette. His grandfather had been the first mayor of Philadelphia, and Dr. Shippen was related by marriage to the Lees of Virginia and the Livingstons of New York. His grandson was the personal secretary of Thomas Jefferson. The Shippens provided the furnace workers, many of them indentured Scots-Irish servants, with shelter and food for the nine months of operation during the year. The Furnace went "out of blast" during the winter because the water, used for the water wheel, froze. By the time of the Revolutionary War, the Furnace operation was large enough to support on-site workers who lived in small log cabins built on the property. The Furnace passed into the hands of the three equally prominent brothers in the 1840s--Charles, George, and Selden Scranton, for whom the Pennsylvania city is named. The Scrantons ensured the longevity of the Oxford Furnace. Iron furnaces were changing to the use of coal as fuel (rather than charcoal), and the brothers invested in railroads. Thus, the Furnace never lacked for anthracite coal from the mines of Pennsylvania. In 1935 the Warren Foundry & Pipe Co. donated the Furnace to the State. 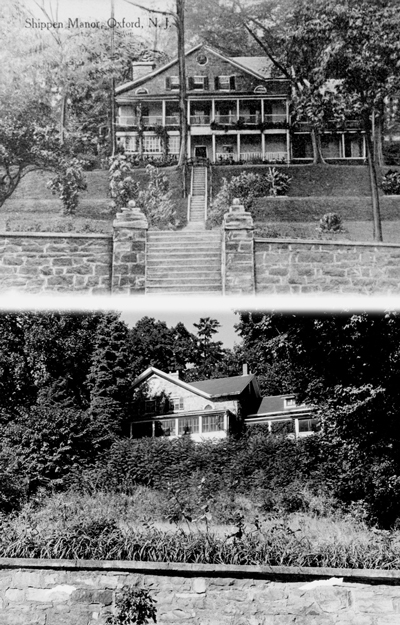 In 1984 the state sold the Furnace, as well as the Manor, to Warren County. 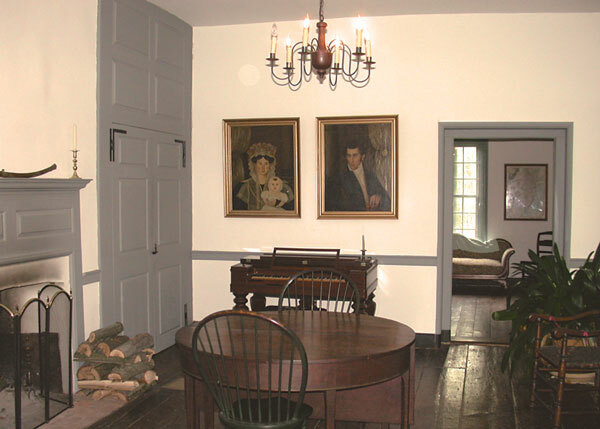 The Shippen Manor Museum opened in 1995, after the house was restored, and is furnished in colonial and Victorian periods. Costumed docents lead tour groups and demonstrate open-hearth cooking, and there are period musical performers present on occassion. Each summer the property hosts a popular series of free outdoor concerts on Sundays. Originally the Manor had eight rooms (with an additional four in the cellar), but in the early 1800s an addition provided four more rooms (three more in the cellar). Two of the original rooms were combined into a formal parlor, to make a total of eleven rooms. The Manor’s interior reflects finery of the past. The Museum is open the first and second Sundays of each month, 1-4pm, except on holiday weekends. Mid-week tours can be arranged by appointment. The suggested donation is $3; students and young children are free. For more information, call (908)453-4381. Or check the website. 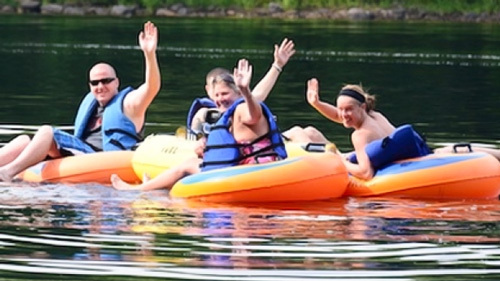 Located on the Delaware River near the Delaware Water Gap, where you?ll enjoy raft, canoe, kayak or tube trips, the campground offers trailer and tent campsites as well as trailer and cabin rentals.